This is a marvelous paper by Eric Andersen, from the CMAA conference in St. Paul, Minnesota. 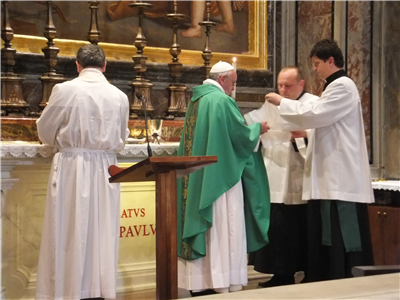 According to reports at Rorate, it appears Pope Francis celebrated Mass ad orientem at the tomb of Blessed Pope John Paul II this morning. Is it a sign of things to come? At the very least, I think it's a very positive sign that he is not actively against celebrating ad orientem. If nothing else, it's a good support for those parishes doing so already. 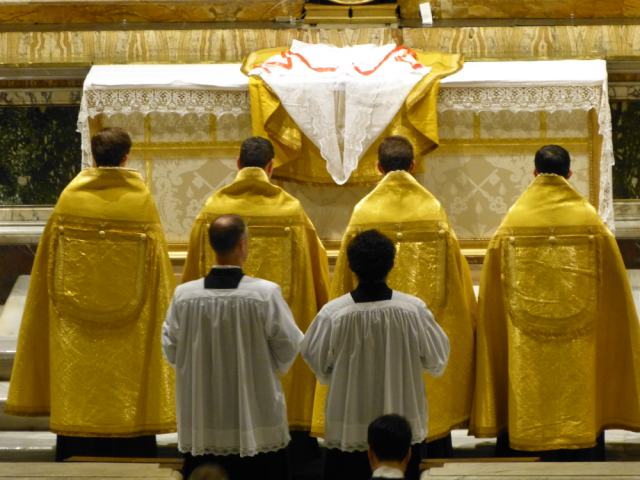 On this Vigil of All Saints, I am very happy to share with the readers of New Liturgical Movement an article offered to us by the Academic Dean of Wyoming Catholic College, Dr. Jeremy Holmes. It is a most appropriate reflection as we circle around to the annual celebration of the citizens of the Heavenly Jerusalem, the countless host of angels and souls who worship the Lamb in eternal joy. 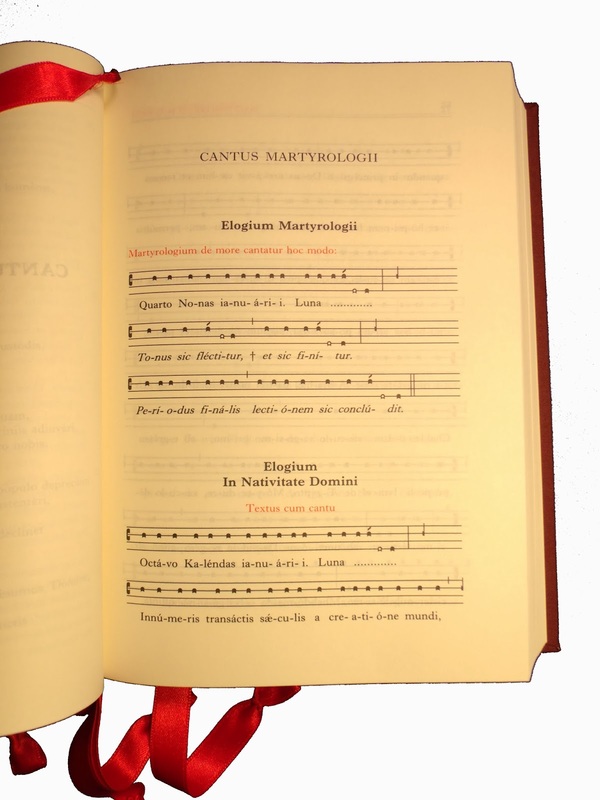 See if you can answer this Catholic trivia question without reading ahead: What post-Vatican II liturgical book intended for daily use has never been published in English? Even my well-educated Catholic friends, and even those reading and publishing in the area of liturgy, have trouble coming up with an answer. The average Catholic boggles at the very idea. Answer: the Roman Martyrology. The most recent edition was published in Latin in 2004, but ever since Vatican II—which most American Catholics identify with the movement of liturgy into English—no edition of the post-conciliar revision has been published in translation. It seems that a translation was submitted to Rome five years ago or more, but it has been idling in the Vatican offices all the while. The average Catholic does not know that the Martyrology even exists, and while the liturgically educated usually do know it exists, it is so far off the beaten path that most are unaware of whether it exists in the vernacular or not. It’s an unfortunate situation, because the Martyrology really ought to be more widely known and celebrated. 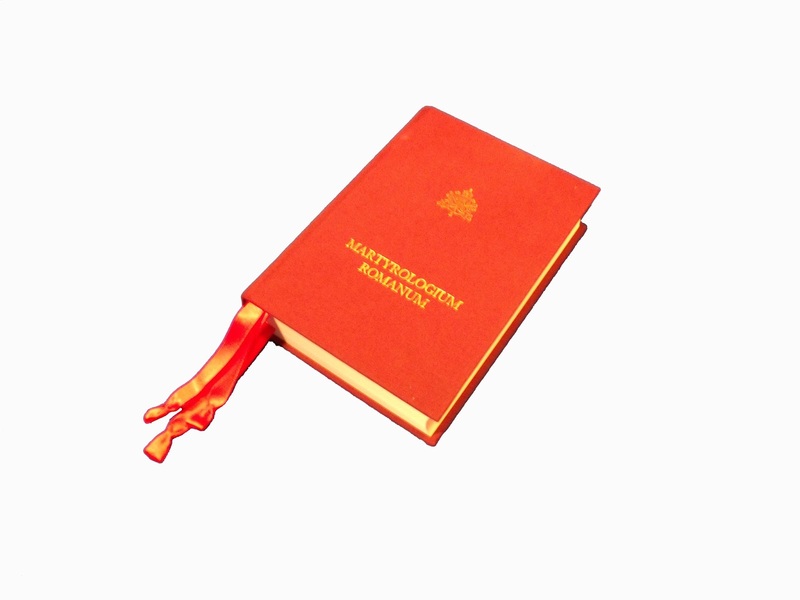 The 2004 Roman Martyrology is a handsome, burgundy hardback with five red ribbons. 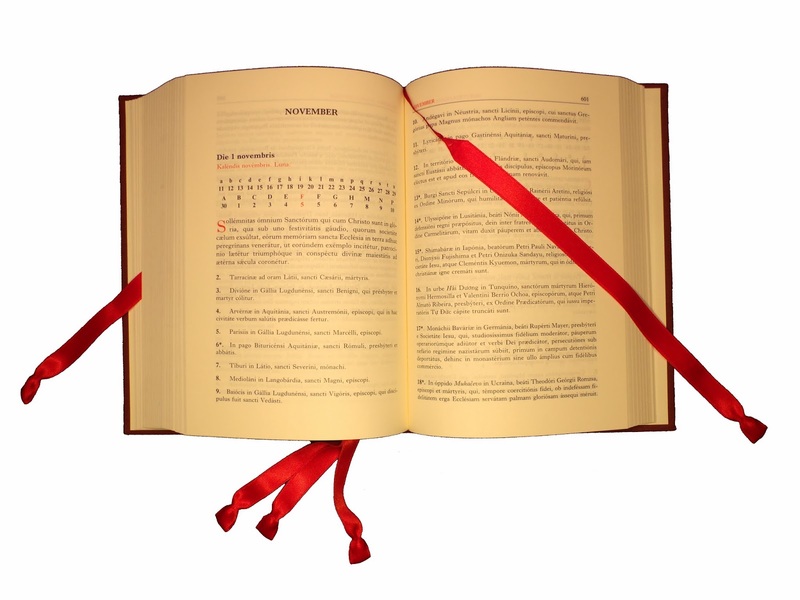 One ribbon marks the rubrics for praying the Martyrology, either as part of the Liturgy of the Hours or as its own liturgy, and another marks the biblical readings which form an optional part of the celebration. A third ribbon marks the closing prayers, and a fourth the chant tones for the various parts. The fifth ribbon marks the current day, with the name, place, and a brief description of each saint commemorated. Although devotion to the saints remains strong in many Catholic homes, it often seems an affair separate from liturgical prayer. Unless there are propers in the Mass or the Breviary, Catholics generally think that a saint’s “feast day” means a day when you can have a cake or sing a song at home. They don’t realize that every saint with a feast day is commemorated by a liturgical act. 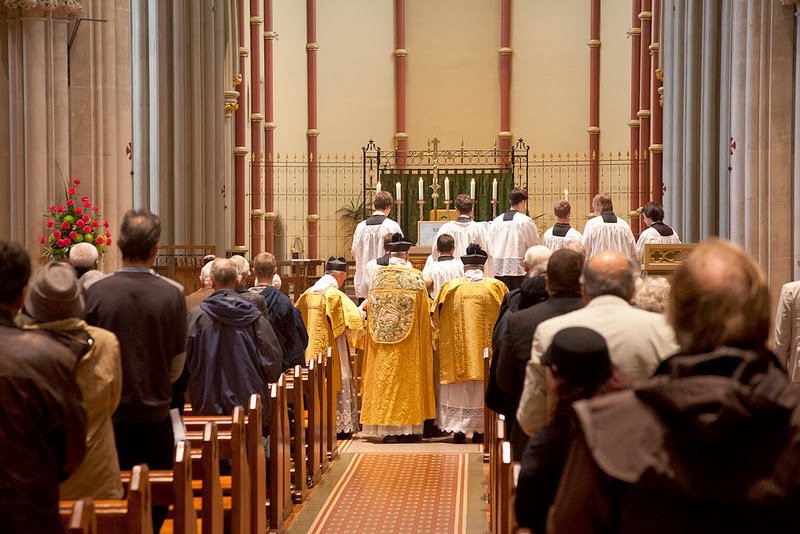 Even well-educated Catholics tend to think that the number of saints celebrated over the course of the liturgical year is limited by the number of days in the year, when in reality a typical day in the Church sees the liturgical remembrance of 20 or more. By the same token, Catholics often think that a Sunday “cancels” the feast of a saint. I have often heard people say that we will “lose” so-and-so’s feast this year because it falls on a Sunday. They don’t realize that, although we do not use the propers of that feast at Mass on a Sunday, the feast of that day is in fact liturgically celebrated via the reading or chanting of the Martyrology. So for example when Pope Francis asked the Church to fast on the eve of the feast of the Birth of Mary, it made sense—even though that feast fell on a Sunday this year. Ironically, the last edition (1956) of the Martyrology for the preconciliar Extraordinary Form—which most people identify as “the Latin liturgy”—has been available in English since 1962, although the translation by Canon J. B. O’Connell does not carry approval for liturgical use and seems to have been prepared for the sake of private devotion and study. However, John Paul II canonized a lot of saints, and for specific purposes: he wanted people to know about saints of modern times, suffering modern conditions, and from every walk of life. His purposes are lost on most of the world, because without the current Martyrology people remain only vaguely aware of the newly canonized men and women. Besides having the specific advantage of more modern saints, greater awareness of the current Martyrology could subtly change the way people tend to compare the liturgies of the Ordinary and Extraordinary Forms. For example, one often hears that the Extraordinary Form has more “saints days” than the Ordinary Form. While it is true that in the Ordinary Form there are fewer days in the calendar marked by Masses with propers and readings tied to the sanctoral cycle, it is not true, simply speaking, that the Ordinary Form has fewer liturgical celebrations of saints. In fact, due to a greatly enriched Martyrology, more saints are celebrated in the Ordinary Form than ever before, an impression that grows on one who uses the old version and experiences firsthand the glaring absence of many recently canonized saints—including great devotees of the traditional liturgy such as St. Pio of Pietrelcina and St. Josemaria Escriva. While this expansion of the Martyrology does not directly address the question of how many Masses proper to individual saints the sanctoral cycle should have, it does change the context of the question somewhat. 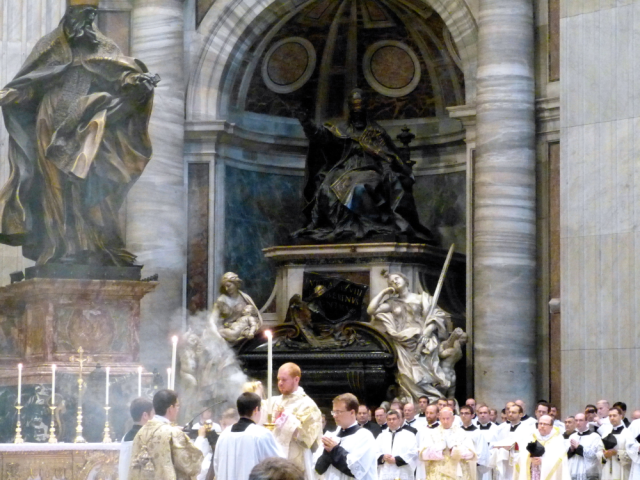 In a similar vein, it is well known that, in reforming the liturgical calendar after the Council, the Vatican placed great emphasis on historical reliability. Saints that seem to have been merely legendary, or whose existence cannot be proved, were dropped from the general calendar. However, this move toward the historical was not as sweeping as is generally thought. Often, when something about a saint cannot be verified, his life is described in the Martyrology under the clause ut fertur, “as is said.” Most notably, Old Testament figures such as Job and Jonah, whose lives or even whose existences are often considered to be Hebrew literary creations, retain their feasts in the reformed liturgical calendar as officially given in the book of the saints. As a record of all those whom the Church has declared to be citizens of heaven, the Martyrology resembles that “book of life” mentioned in Scripture, in which God is said to have written the names of all the saved. Just as the printed name is a sign of the saint commemorated, so the book as a whole is a sign of the heavenly Jerusalem, our eternal home. To hold it in one’s hands is to think of life’s end and goal. So it is truly a shame that the current Roman Martyrology is not more widely known and prayed. For English readers at any rate, this is largely the fault of delays in making available to the public a translation of the 2004 edition. Since the book includes rubrics for celebration by laypersons, the intention seems to have been that the Roman Martyrology would become more widely used, as has occurred with the Liturgy of the Hours. We can hope that someone in the offices of ICEL will take note—and take action. I am pleased to announce for those readers up in Alaska, that the Solemn Mass of All Saints will be celebrated at the Cathedral of the Holy Family in Anchorage AK at 5:30 p.m. this Friday, November 1, according to the traditional Dominican Rite. The major ministers will be: Fr. Paul Raftery, O.P., priest; Fr. Mark Francis Manzano, O.P., deacon; and Mr. Michael Rannal, subdeacon. 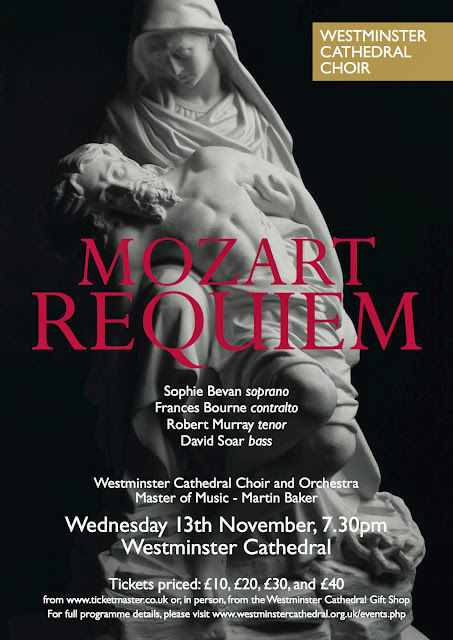 The choir will be singing music by Franz Joseph Haydn and Tomas Luis de Victoria, as well as the Dominican chant propers. 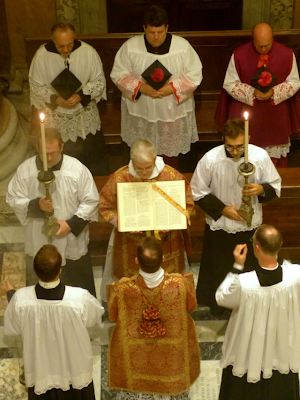 A Dominican Rite Missa Cantata is sung every Sunday at 4:00 p.m. in the Cathedral. The cathedral is staffed by friars of the Western Dominican Province. 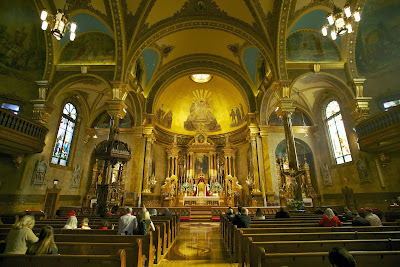 On Sunday I took the opportunity to visit St John Cantius in Chicago, IL, a church which I have posted about before but never until now had the chance to visit. On the front of the church, large letters spell out 'Ad majorem Dei gloriam', to the greater glory of God, a phrase which always reminds me of the Cardinal Vaughan School, a unique and remarkable school in London where I directed the Schola for many years; the boys there used to write the abbreviated form A.M.D.G. at the end of every piece of work. 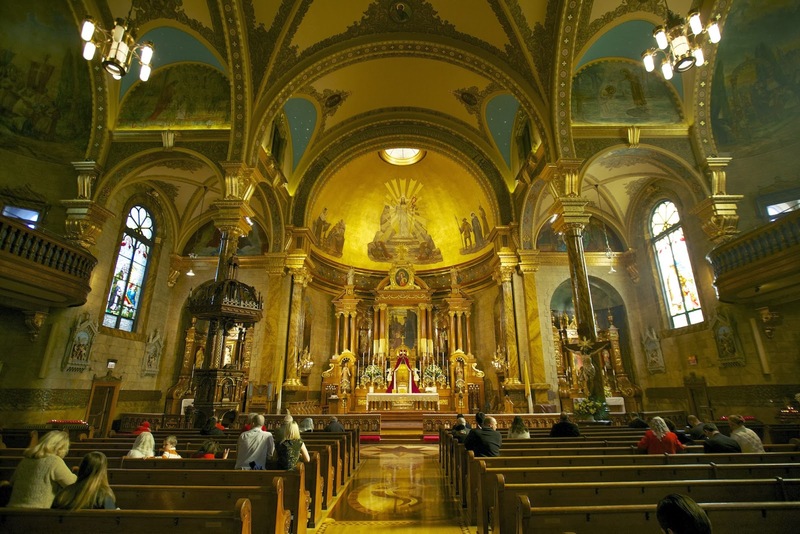 The exterior of St John Cantius, named for a Polish Saint, belies the interior of the church which quite literally took my breath away, overwhelmingly beautiful, lovingly restored, the sweet smell of incense serving to emphasise the sacred purpose of the church. As I entered, the Pastor, Father Frank Phillips, was addressing a group of children, explaining the meaning of various signs in the church, in particular those on the wooden inlaid floor. He spoke to them in understandable terms yet without speaking down to them. Along both sides of the church were lines of people waiting for confession. 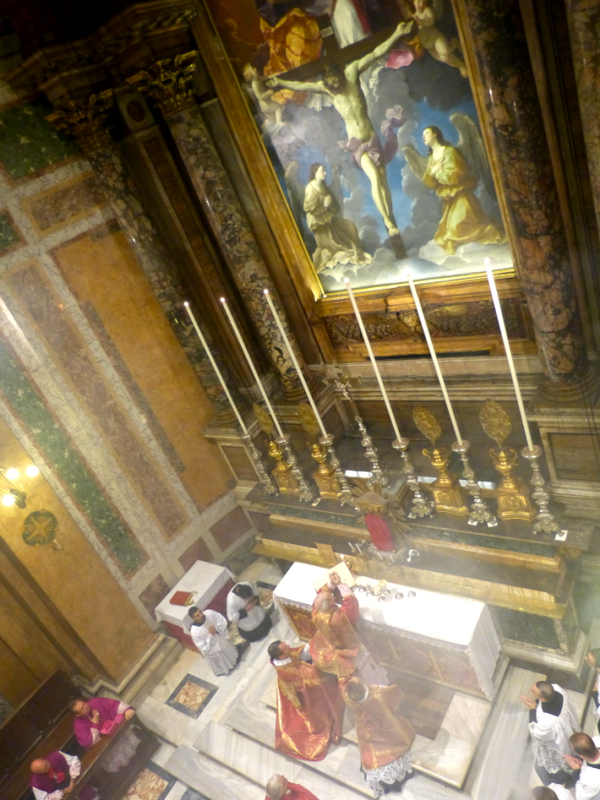 The pews were filled with people in silent prayer, both preparing for Mass and having been to Mass. The words over the Altar are most apposite: Domus mea domus orationis est. 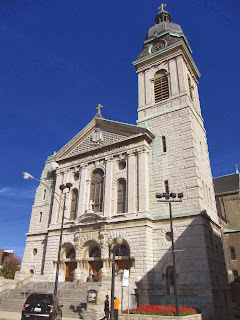 I attended both the 11am and the 12.30pm Masses, the first of which was a Novus Ordo Mass in Latin, the second of which was a Tridentine Mass, the sanctuary filled with a number of seminarians visiting from Detroit. (In addition there is a Tridentine Low Mass at 7.30am and a Novus Ordo Mass in English at 9am, so you might say that the whole spectrum is covered.) The Liturgy was magnificent at both Masses with the Chant Propers sung by the wonderful Schola, and at the Extraordinary Form Mass there was also a beautiful choir which even sang a polyphonic Credo. 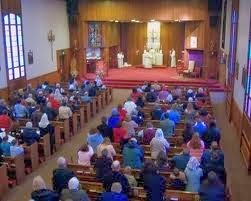 The church was full for both Masses and there were a large number of immaculately behaved young children at both. The people were kind and welcoming, especially the lovely lady running the shop at the back who quickly picked up on my 'accent' and realised I had come a long way. And I'm so glad I had. For any who might be interested, I have three speaking engagements coming up in the next few weeks; in Vermont, New Hampshire and New York City. The first is at Vermont Catholic Conference which is an all-day event taking place at St Monica's Church in Barre, VT on Saturday November 2nd. The broad theme is 'Rebuild My Church', evoking the call of evangelisation of both Pope Francis and St Francis of Assisi. I will be speaking about how the style and beauty of liturgical art communicates the truths of the Faith with a special focus on the artistic liturgical traditions as described by Pope Emeritus Benedict XVI, with a particular focus on his book, the Spirit of the Liturgy. I am one of a number of speakers supporting the keynote speaker, Sheila Liaugminas, who will be speaking on the Faith and the Family in the modern world. Follow the link above for more information and to register for the conference. The second is at St Raphael's Church in Manchester, NH on Tuesday, November 5th at 7pm. I have been asked to talk about the role of the artist in the Church today and it will involve a short presentation, about half and hour and then discussion chaired by pastor Fr Jerome. This is one of a series of three, the first is today, in which professionals discuss their work in the context of the Faith. For information follow the link here. The third is on Saturday, November 14th, 7.30pm at the Catholic Center at New York University, 238 Thomson Street, NY, NY. This is one of a series called the Art of the Beautiful sponsored by the Thomistic Institute, which has as series of monthly lectures running through to February next year. Their promotional poster is below. 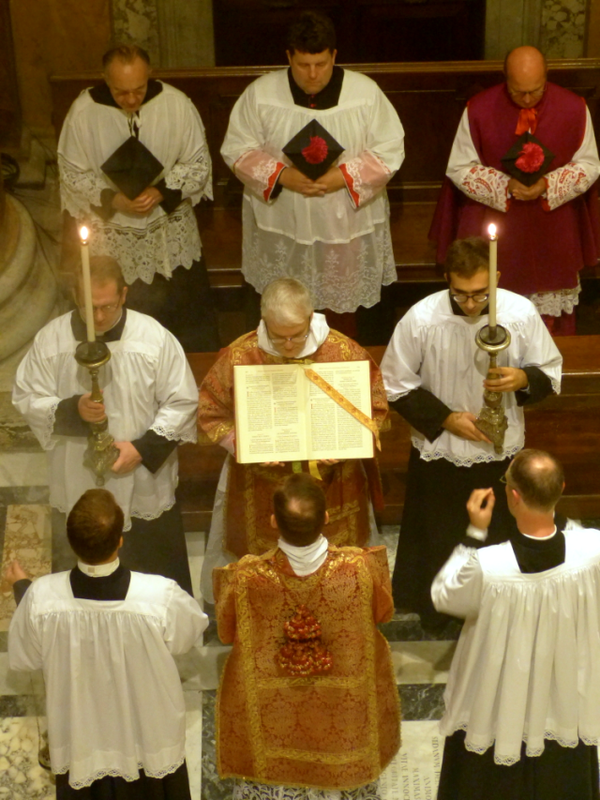 Our dear friends from the Schola Sainte Cécile in Paris have posted some wonderful photos from Rome, where they sang at three of the four major ceremonies of the Populus Summorum Pontificum pilgrimage for the closure of the Year of the Faith. On October 24th, His Excellency Archbishop Guido Pozzo, secretary of the Ecclesia Dei Commssion, celebrated Pontifical Vespers of St. Raphael the Archangel at the Fraternity of St. Peter’s Roman parish, Santissima Trinità dei Pellegrini. The choir was split into three groups, two in the smaller choir lofts above the sanctuary on either side, with a third, larger group in the main loft at the back of the church. The psalmody alternated between the faithful seated in the nave, the two small choirs, the faithful again, and the large choir; the effect was truly remarkable. 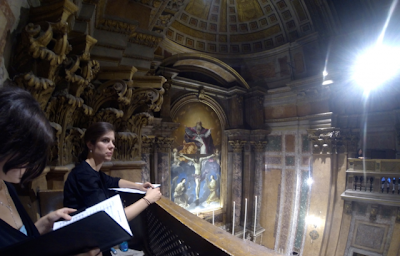 The Magnificat was done in a beautiful setting by Palestrina, again alternating the choirs. 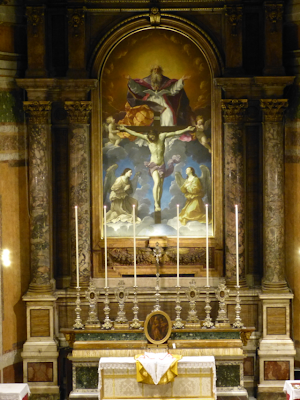 The altar of Trinità dei Pellegrini prepared for Pontifical Vespers. 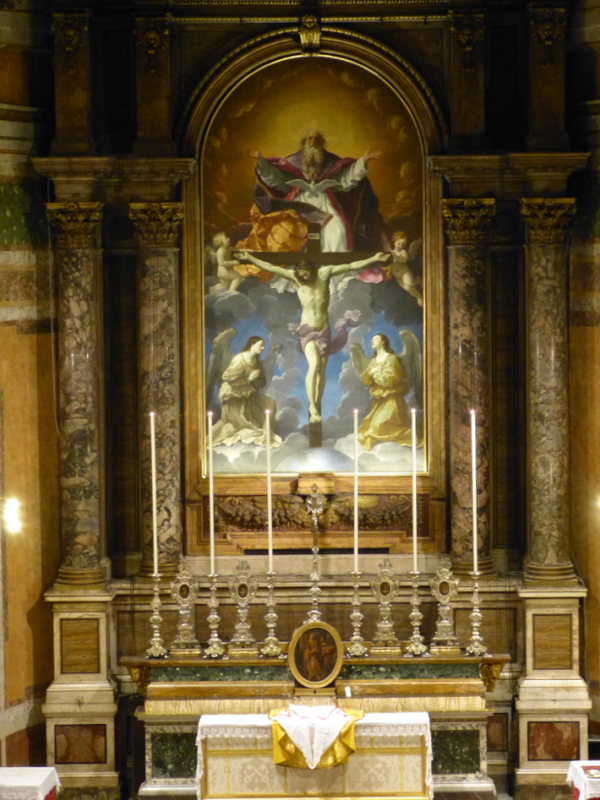 The tabernacle of the main altar is on runners, and can be pushed backwards to move it out of the way, since Pontifical ceremonies are not to be done at an altar where the Blessed Sacrament is reserved. The medallion painting of St. Raphael and Tobias is one four that normally sit on top of the large armoires in the sacristy. The view from the Gospel side choir loft. The coped assistants and acolyes enter for Vespers. The dressing of the bishop. The bishop ascends the altar to give his blessing at the end. The following evening, H.E. Bishop Athanasius Schneider, Auxiliary Bishop of Maria Santissima in Astana, Kazakhstan, celebrated a Pontifical Votive Mass of the Holy Cross, also at Trinità dei Pellegrini. In addition to the Gregorian propers (again sung by dividing the choir into different parts), the Ordinary was sung in a polyphonic setting by Hans Leo Hassler, as well as several motets: Vexilla Regis by de Bertrand, a Tantum Ergo by Victoria, etc. I was the second MC at this ceremony, and it was musically one of the most impressive things I have ever heard at a liturgy. 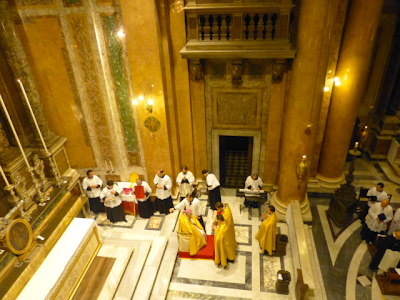 The chanting of the Gospel, as seen from the choir loft on the Epistle side. I am pleased to remind our readers that this coming Saturday, November 2, at 10 a.m., a traditional Dominican Rite Missa Cantata Requiem Mass will be celebrated at St. Albert the Great Priory, 5890 Birch Court, Oakland CA on the occasion of All Souls Day. This Mass is organized by the students of the Western Dominican Province, who will sing the Dominican Propers and Ordinary, as well as serve the Mass. 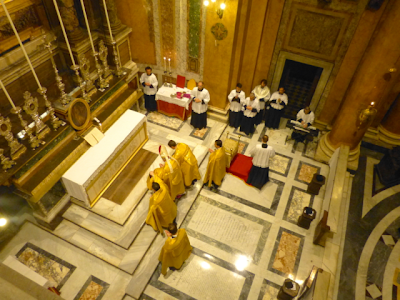 The Missa Cantata will be preceded by the Ordinary Form Community Mass of All Souls at 8 a.m., and so will use the texts of the Second Mass of All Souls. It will be followed by the Third Mass of All Souls (Low Mass, Dominican Rite) at 11:15 a.m. All three Masses, including the Community Mass are open to the public. Confessions will be heard for the First Saturday Devotion from 9:30 to 9:50 in the Priory Chapel (Gospel-Side Transept). The chapel is most easily entered at 6172 Chabot Road, Oakland CA, where there is also public parking in the old tennis court. For other up-coming Dominican Rite Masses in the Bay Area and Western Dominican Province, check here. High Mass was celebrated yesterday in the Extraordinary Form marking the Feast of Christ the King at Portsmouth Cathedral in the presence of Rt Rev Philip Egan, Bishop of Portsmouth. The music was sung by the Schola Gregoriana of Cambridge directed by Christopher Hodkinson. 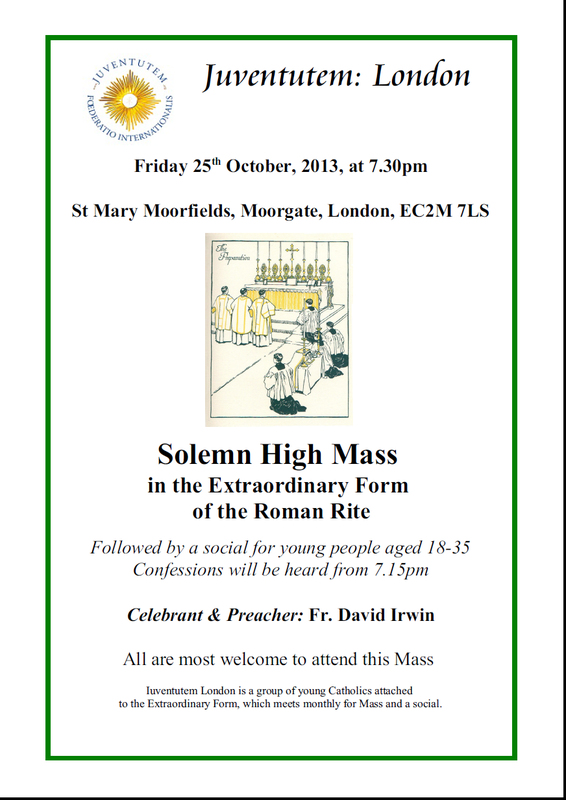 A video of the Mass is available here. 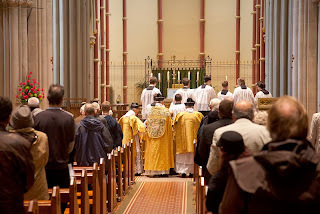 As the Bishop of this diocese, I'm very happy to encourage, where there is a wish, the celebration of the Roman Rite in the Extraordinary Form, and more, to ensure that across the Diocese of Portsmouth, celebrations in Latin of the Novus Ordo, ideally with plainchant, find a rightful place in the diversity of our Diocesan Liturgy. 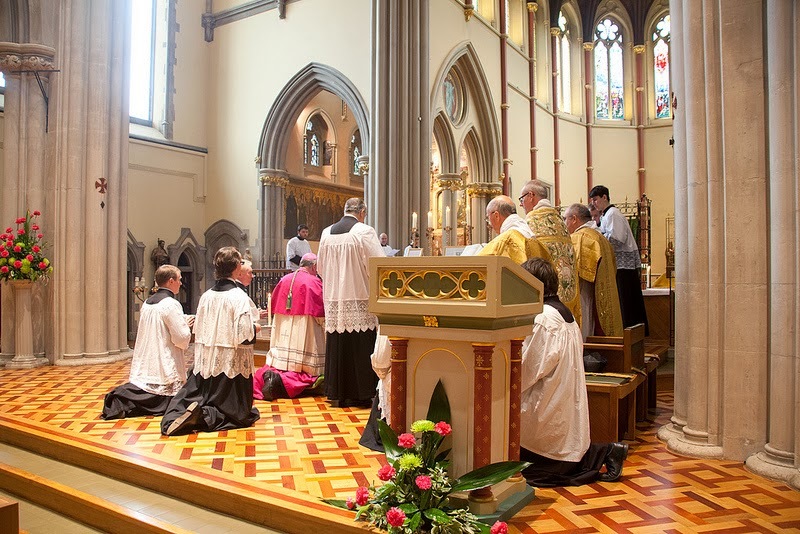 When Mass is celebrated in Latin, it is a splendid reminder of the Catholicity or universality of the Church across space and time, that all of us, past, present and future, belong to one great family, the people of God. Latin, with its poetry, majesty and economy, is, along with Greek and Hebrew, a sacred language that is a sacramental that places us before God's transcendence. And this is a vital corrective to the modern tendency to stress immanence with the danger of reducing God to a false god, namely a 'warm feeling' within. Indeed I might add that although unfamiliar with it myself, the Extraordinary Form expressly reminds us that Mass in either form is not merely a communion meal but a ritual of love, a sacrifice at Calvary, by which, for you and for me, yes, here and now, Jesus Christ lays down his life. Recently I featured carved icons by Russian Rashid and Inessa Azbuhanov. Also on their website, here, there is a section entitled Avante Garde 21st Century Art (I am assuming that the Google translator is accurate here). I imagine that the artists describe them in this way because they do not think of them as works of sacred art at all. I think that these are worth looking at in the context of sacred art. What I find on their site are some geometric patterns that I would happily see as the basis for tiled floors, for example, in churches. The artists have given each one a title which assigns an allegorical meaning to them. I don't understand the basis of these and without wishing to undermine any significance that they see in them, we are entitled to see them in the light of traditional numerical symbolism and use them in the light of this. 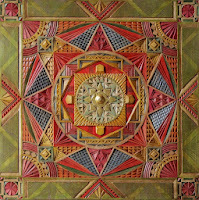 So any shapes with octagonal symmetry, for example, could be used in a sanctuary floor given the symbolism of Christ as the 'eighth day' of Creation. In some ways they remind me of traditional Romanesque, western patterns, but there are also elements that I have not seen elsewhere before. Do We Pray for "the Dead" or for "the Faithful Departed"? With November, the Month of All Souls, around the corner, it seems pertinent to raise the question: Are we in danger of a slow corruption of our understanding of liturgical prayer for the dead? Put differently, for which souls are we praying at Mass? If one examines liturgical formulae to see how Catholics pray for the dead, one is struck by the specificity of intention, the delimited subject of these prayers—namely, baptized Christians. A much-loved prayer expresses it thus: “May the souls of the faithful departed (fidelium animae defunctorum), through the mercy of God, rest in peace.” As will be demonstrated below, the official liturgical books offer overwhelming evidence for this claim. First, however, let us consider what might be called the problem on the ground. That the dead may rejoice forever in the house of the Lord… (p. 1); That the Son of Man may grant his salvation to those who have died… (p. 3); That the eternal light of salvation may shine upon those who have died (p. 6); That those who have died may find eternal rest… (p. 7); For our deceased relatives and friends, and all the departed, that they may be gathered into the eternal joy of their heavenly home… (p. 16); That the dead may be cleansed from all their sins… (p. 28); That the departed may taste and see the eternal goodness of God… (p. 39); That those who have died may live for ever in the God who is love (p. 66); That the dead may be called to perfect union with God for ever (p. 67); etc. Although I have not tabulated the hundreds of petitions for the dead included in this volume, my impression from using the book is that the language goes about half of the time in the traditional direction and the other half of the time in the generic/undifferentiated direction. Bring all the dead into the light that no darkness can quench; may we all meet in joy with you (p. 59); That Jesus, who is our resurrection and life, may give peace for ever to all who have died (p. 292). The problem was brought home to me when I was attending Mass at the Cathedral of the Madeleine in Salt Lake City one Sunday morning, and the deacon offered a public prayer for the deceased wife of the head of the Mormon church. This was, on any reading of it, an absurd petition to make, since the true Church of Jesus Christ has already defined that Mormons are not confessionally Christian and that their “baptism” is null and void. In summary, at a Novus Ordo Mass we will frequently hear something like: “Let us pray for the dead…” or “For all who have died this week…” or “For all our departed loved ones…”—with no specificity or delineation that we are praying for Christians or faithful who have died. To pray at the liturgy for someone who is either not known to have been a baptized Christian or known to have not been a baptized Christian, or to offer prayers “for the dead” in a completely generic way, without specifying that we are praying for departed brethren and servants of God, is not just a departure from custom; it implies and leads to theological error. Those who are not Christian when they die cannot be saved; and the only people we know to be Christians in such a manner that we may publicly pray for them are those who were baptized or were formally seeking baptism (e.g., RCIA candidates). Someone who is neither baptized nor known to have been seeking baptism is simply not someone for whom we can publicly pray, as he or she is not known to be a member of the Mystical Body of Christ, and the liturgy of the Church is the prayer of the Mystical Body of Christ, the prayer of the Head and of the members in union with the Head. It is not the prayer of the non-members and it is only a prayer for non-members who have not yet departed from this world. Once non-members depart from this life, they are eternally non-members and they are never prayed for, either on earth or in heaven. We can establish this fact by reviewing a number of liturgical texts from both the Extraordinary Form and the Ordinary Form of the Roman Rite, since they agree on this theological point, although the usus antiquior expresses it with greater clarity and frequency. We begin with the usus antiquior, giving translations from the Baronius Missal. Offertory. Accept, O holy Father, almighty and eternal God, this unspotted host, which I, Thine unworthy servant, offer to Thee . . . for all faithful Christians, both living and dead . . .
Roman Canon. Remember also, O Lord, Thy servants and handmaidens N. and N., who are gone before us with the sign of faith, and rest in the sleep of peace. To these, O Lord, and to all that rest in Christ, grant, we beseech Thee, a place of refreshing coolness, light, and peace. Collect. O God, the Creator and Redeemer of all the faithful: grant to the souls of Thy servants and handmaidens the remission of all their sins: that through pious supplications, they may obtain that pardon, which they have always desired. Tract. Absolve, O Lord, the souls of all the faithful departed from every bond of sin. And by the help of Thy grace may they be enabled to escape the avenging judgment: and enjoy the bliss of everlasting light. Offertory. O Lord Jesus Christ, King of glory, deliver the souls of all the faithful departed from the pains of hell and from the bottomless pit: deliver them from the lion’s mouth, that hell swallow them not up, that they fall not into darkness, but let the standard-bearer Holy Michael lead them into that holy light, which Thou didst promise to Abraham and to his seed. . . .
Secret. Mercifully regard, we beseech Thee, O Lord, the Sacrifice which we offer Thee for the souls of Thy servants and handmaidens: that to those to whom Thou didst grant the favour of the Christian Faith, Thou wouldst also grant due reward. Preface. For to Thy faithful people, Lord, life is changed, not taken away; and when the home of this earthly sojourn is dissolved, an eternal dwelling is made ready in heaven. Wherefore suffer not, we beseech Thee, the sentence Thou pronouncest in judgment upon one whom the faithful prayer of Christian people commends to Thee, to be a doom which shall crush him utterly. Rather succour him by Thy gracious favour, that he may escape Thine avenging justice who, in his lifetime, was signed with the seal of the holy Trinity. Grant to Thy servant departed, O Lord, we beseech Thee, this favour, that he who desired to do Thy will may not receive punishment for his deeds; and that even as here on earth the true faith joined him to the ranks of the faithful, so in heaven by Thy mercy he may have fellowship with the choirs of Angels. Other prayers could be cited, but that’s plenty to establish the point. From the earliest liturgical records down to the 1962 editio typica of the Missale Romanum, when Catholics of all places and times prayed for the dead, this is how they prayed. Preface I for the Dead. Indeed for your faithful, Lord, life is changed not ended, and, when this earthly dwelling turns to dust, an eternal dwelling is made ready for them in heaven. Eucharistic Prayer I. Remember also, Lord, your servants N. and N., who have gone before us with the sign of faith and rest in the sleep of peace. Grant them, O Lord, we pray, and all who sleep in Christ, a place of refreshment, light and peace. Eucharistic Prayer II. Remember also our brothers and sisters who have fallen asleep in the hope of the resurrection, and all who have died in your mercy: welcome them into the light of your face. Eucharistic Prayer II (in Masses for the Dead). Remember your servant N., whom you have called (today) from this world to yourself. Grant that he (she) who was united with your Son in a death like his, may also be one with him in his Resurrection. Eucharistic Prayer III. To our departed brothers and sisters and to all who were pleasing to you at their passing from this life, give kind admittance to your kingdom. There we hope to enjoy for ever the fullness of your glory through Christ our Lord, through whom you bestow on the world all that is good. Eucharistic Prayer III (in Masses for the Dead). Remember your servant N. whom you have called (today) from this world to yourself. Grant that he (she) who was united with your Son in a death like his, may also be one with him in his Resurrection, when from the earth he will raise up in the flesh those who have died, and transform our lowly body after the pattern of his own glorious body. Eucharistic Prayer IV. Remember also those who have died in the peace of your Christ and all the dead, whose faith you alone have known. The last text, from E.P. IV, is the most ambiguous of the lot, but inasmuch as it mentions the faith of the departed, it is asserting (in line with defined Catholic doctrine) that God knows if a man or woman died with a sufficiently explicit and living faith in Christ the Redeemer to have been a sharer in the fruits of Redemption. “All who have died in your mercy,” from E.P. II, is a similar kind of formula. 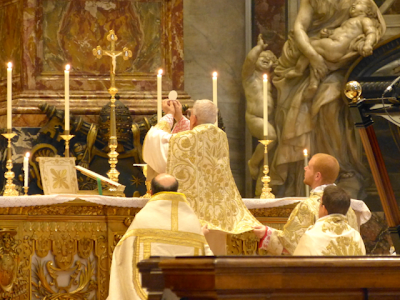 Second Mass, Collect. O God, glory of the faithful and life of the just, by the Death and Resurrection of whose Son we have been redeemed, look mercifully on your departed servants, that, just as they professed the mystery of our resurrection, so they may merit to receive the joys of eternal happiness. Second Mass, Prayer over the Offerings. Almighty and merciful God, by means of these sacrificial offerings wash away, we pray, in the Blood of Christ, the sins of your departed servants, for you purify unceasingly by your merciful forgiveness those you once cleansed in the waters of Baptism. Third Mass, Postcommunion. Through these sacrificial gifts which we have received, O Lord, bestow on your departed servants your great mercy and, to those you have endowed with the grace of Baptism, grant also the fullness of eternal joy. In order to benefit from the Eucharistic Sacrifice or any other liturgical action of Christ and His Church, a departed soul must already be in communion with Christ and His Church. This is the reason we pray for those souls. If one has followed the earlier theological reasoning about the very nature of the liturgy, one can see that the question of whom we pray for, and under what aspect or title, is a far from trivial matter. It goes the very heart of what it means to be a Christian, to be sanctified, to be graced with the very ability to reach heaven. It is not enough that Christ accomplished our Redemption on the Cross (objectively, one can say); we ourselves, each one of us, must actually (or subjectively) participate in it through faith and the sacraments, especially baptism. Without that actual participation in His Death and Resurrection, there is no salvation for us; and we do not, we cannot, find that participation apart from His Mystical Body, the Church, which, in her inner identity, is nothing other than perfect communion with Christ. Thus, to ask what difference it makes whether we pray for (e.g.) “the dead” or “our dead,” “the departed” or “the faithful departed,” is precisely a test case of whether we adhere to the de fide doctrine extra ecclesiam nulla salus, “outside of the Church there is no salvation,” or have instead imbibed the poison of indifferentism, latitudinarianism, and false ecumenism, all of which involve a denial of Jesus Christ as the one Savior of mankind and the Catholic Church as His very Body in which all will be saved who are to be saved. Two courses of action therefore suggest themselves. First, at a minimum, the Prayer of the Faithful or General Intercessions in an Ordinary Form liturgy must be written out with care so that we are raising up prayers for “the faithful departed,” “our brothers and sisters in Christ,” etc., and if a published version is used, it should be reviewed ahead of time (and corrected, if need be). 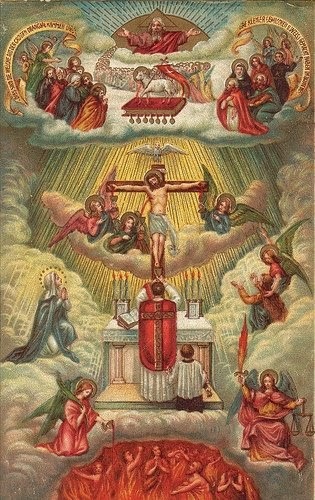 Second, we desperately need a renewal of catechesis in this area, because it touches on fundamentals of the Catholic Faith such as the necessity of belonging to Christ and the Church for salvation, the necessity of dying in a state of sanctifying grace in order to be admitted to the beatific vision (whether immediately or after purgation), the eternity of hell and the impenitence of the damned. These truths are not sufficiently known or preached nowadays, and given the truth of the axiom lex orandi, lex credendi, the way we are praying for the dead, week in and week out, will either confirm true doctrine or reinforce false doctrine. Animae omnium fidelium defunctorum, per misericordiam Dei, requiescant in pace. Amen. The façade, built towards the end of the 11th century, is decorated with a classically Tuscan mix of local white and green marbles, as can also be seen in the city’s Baptistery and the façade of Santa Maria Novella. As in many Italian Romanesque churches, the choir and principal sanctuary are significantly higher than the floor of the nave, with a crypt directly below it, much lower than the floor of the nave. The relics of San Miniato are in the altar of the crypt-chapel. The small aediculum seen in the middle used to house a famous crucifix. Saint John Gualbert, a Florentine monastic reformer of the 11th century, once came to pray before it and ask whether he was indeed called to become a monk; his vocation was confirmed when the figure of Christ on the cross nodded to him. The nave seen from the choir. The choir of the church contains a great deal of very beautiful and elaborate inlaid marble work from the early 13th century, as seen here on the side of the main pulpit. The balustrade of the choir. The crucifix in the background is attributed the famous Della Robbia workshop, better known for their colored terracotta work. Frescoes from various periods survive on the walls of San Miniato one right next to another; here, the part on the left is from the later 13th or early 14th century, the part on the right (Saint Jerome) from the mid-15th. In many other Florentine churches, as elsewhere, walls covered with these works of mixed styles and periods were stripped bare during the Counter-Reformation. More classically Florentine Renaissance frescoes, 15th century. Large images of Saint Christopher such as this were created in reference to the tradition that honored him as a Patron Saint against sudden death. It was popularly believed that if one saw an image of St. Christopher, one would suffer no harm or violence on that day. Pictures of him were therefore made very large so that they would be easy to spot; the tradition that Christopher himself was a giant probably derives them. 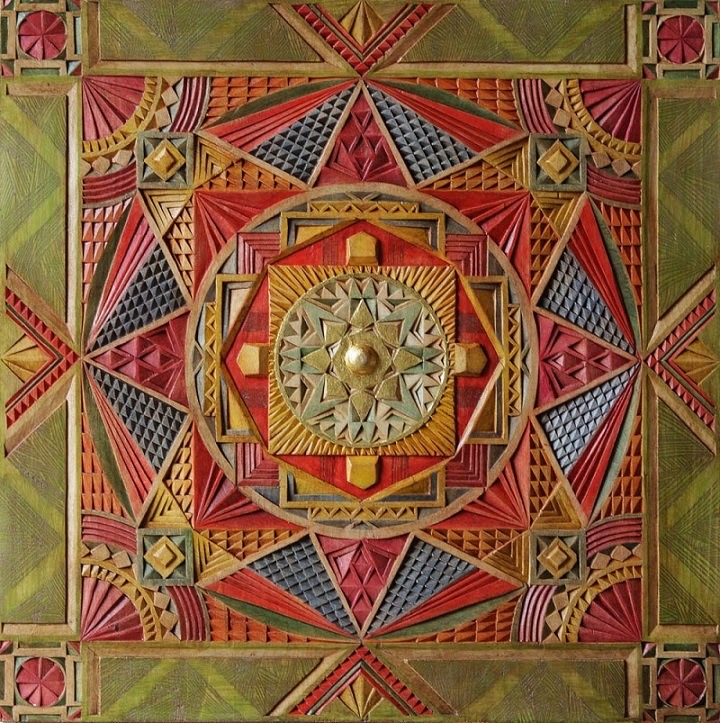 The ceiling of the church also preserves an elaborate style of decoration (here much restored) that was eliminated in many places during the Counter-Reformation. Florence seen from the steps of San Miniato. 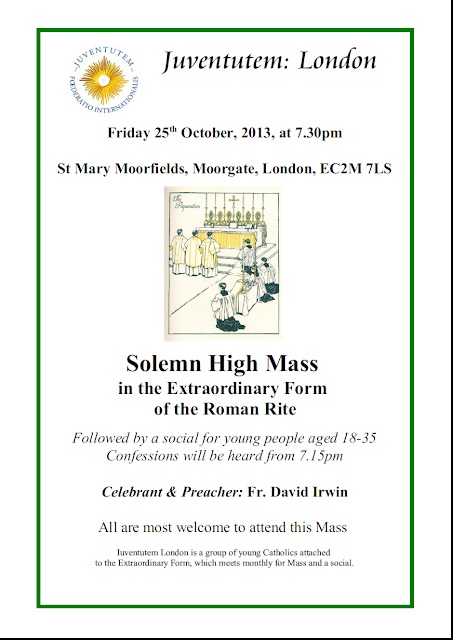 Juventutem London's next Solemn High Mass is this Friday at 7.30pm, details below. 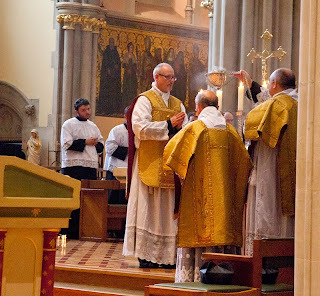 Photographs of last month's Mass can be found here.